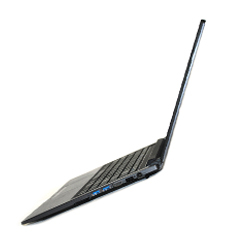 14” Slim, lightweight and heavy duty Ultrabook with curved edges and sleek crafted body. 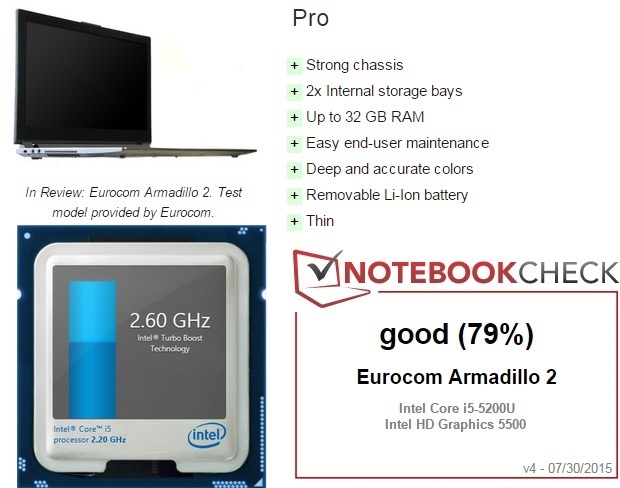 While this may be one of Eurocom's smallest and thinnest offering yet, the Armadillo 2 still packs quite the punch. This heavy duty 14-inch Ultrabook can hold up to 32 GB RAM and two dedicated storage bays, which automatically make it much more spacious than your standard Ultrabook from a major manufacturer. The appeal of the Armadillo 2 lies in its rigidity and accessibility. Its chassis is very tough for the size and is almost as rigid as the magnesium-clad Latitude E7450. The display covers nearly all of the sRGB spectrum and hardware maintenance is generally painless. The dual storage bays, SODIMM slots, quiet keyboard, and removable battery are all especially appreciated. Lastly, support for 32 GB RAM is uncommon for a notebook this size.